P is no longer a victim of human trafficking – she is a survivor, and I’m here to ensure she does more than merely survive. It’s not just a matter of helping her find a job and a place to stay – P needs to find the confidence, self-esteem and sense of self that have been bruised and battered after more than three years as an unwilling wife. P has no interest in seeking another husband, and refuses to let her own value be determined by her relationship to a man. As P has told me numerous times, both in China and Vietnam, what she wants more than anything is her independence and the freedom to travel. In my language, that means a road trip. P goes and buys herself some new jeans, a hoodie and some sneakers. I give her a pair of sunglasses – her first – and rig up a mighty little speaker to the bike, so we can listen to rock as we roll. Over the course of a five-day, 700-kilometre journey through the mountains, P truly comes back to life. It is a privilege to see her rise from the ashes, a Phoenix reborn. We sing, dance, laugh, see new places and make new friends. P, who has never seen so much of her own country before, says I’m a ‘number one’ tour guide. That’s not all she says, either. She talks almost constantly for days. ‘Me, I talk too much,’ P says. ‘Your nose very long, like elephant,’ she tells me. We pass a pregnant sow, and she tells me my girlfriend got too big. We pass a group of buffaloes wallowing in the mud, and she says my friends are so smelly. There are more serious moments, too. There are deeper turns of conversation, unexpected insights, things she’s never told me. Understandably, she doesn’t trust as easily as she once did, and is more cautious now in making new connections. Fortunately she counts me as one of the few true friends within her circle of trust. Which means she doesn’t believe me when I say I’m going to push her off the mountain if she can’t be quiet for one minute, and she goes right on chattering away. On the second day, we’re hit by a tropical deluge. My so-called Storm Master rain jacket fails utterly, and within ten minutes I’m soaked to the skin through five layers of clothing. P, riding in my rainshadow and wearing a cheap plastic poncho, is almost completely dry. P immediately offers to save me from hypothermia with her brand new Mickey Mouse hoodie, though I’m clearly stretching it in every direction and can hear the stitches popping. For the final three days, the sun beams down from clear blue skies, the road surface improves, and the ride is simply stunning. I shoot the footage I need, give P her first lesson in riding the bike, and we succeed in locating the forest trail where she crossed back from China. P tells me she hasn’t been swimming in years, so we find a quiet stretch of river and dive in. Afterwards, as I sit out in the sunshine listening to P splashing and chuckling to herself, I recall her earlier words. It’s certainly been a long time since I’ve laughed this much. I’ve received a lot of attention lately, but The Human, Earth Project has never been a one-man show. I’d like to give thanks to all of you who have helped – and particularly to my brother Nick, whose hard work behind the scenes has been vital to our success. There have been many highs and lows over the past months, and I’d also like to thank those of you who have written in with messages of support and confidence when they were needed most. You know who you are. 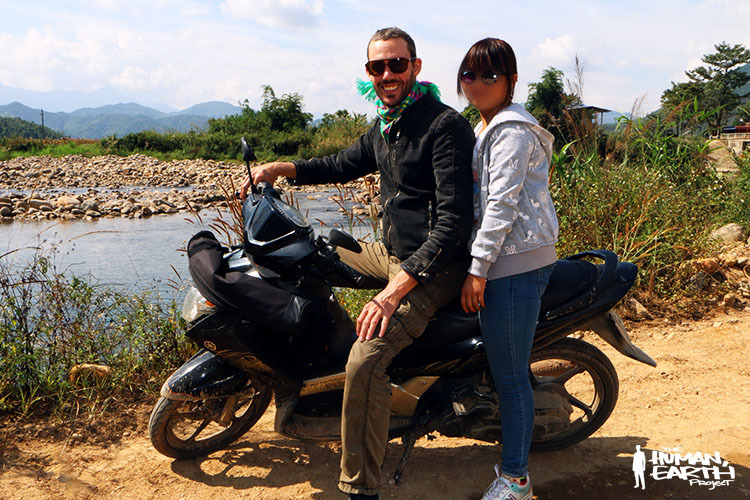 I’ve just uploaded a new video to our website, including snippets of this year’s footage from Vietnam and China, and the first (brief) glimpse of M.
I believe it’s now safe to begin sharing M’s story, and will do so in the coming days. In the meantime, you can see the new video here.